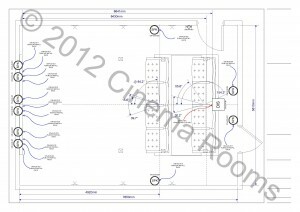 At Cinema Rooms we are able to offer a design and integration service. 3D CAD modelling is also available to see the full potential of the room design and provide visualisations of an existing room. A fly through video which is shot in ghosted wireframe, so the construction of the cinema room can be seen. This communicates the value of visualisation for cinema projects and the benefits of our approach, where the client can see how the room will look and feel before construction commences.